For David, after he had served the purpose of God in his own generation, fell asleep and was laid with his fathers and saw corruption, but he whom God raised up did not see corruption. (Acts 13:35-37). O! It is grievous to think of our precious Lord being nailed to the cross as He was on ‘Good’ Friday. It IS a Good Friday because His life, death, and resurrection makes it possible for sins to be forgiven once and for all. Jesus’ work on the cross made permanent reconciliation with His called ones possible. It was effectual and final. But oh! To think of his broken body being carefully lowered from the cross, quickly prepared for burial, and laid in a dark tomb…. it wounds the conscience. It darkens the heart. It grieves the flesh. Death is final, the body no more thriving with movement and color. Only limp, pale, dead tissue- a lump of nothing that came from dust and will turn to dust. And Joseph bought a linen shroud, and taking him down, wrapped him in the linen shroud and laid him in a tomb that had been cut out of the rock. And he rolled a stone against the entrance of the tomb. (Mark 15:46). But no! Not Christ’s body! He will not see decay. However, the grief and suffering of His disciples who did not know that at the time, is woeful to consider. Giotto painted the lamentation over Christ’s death in the early 1300s. Grief is palpable to the viewer. The dead tree on the hillside symbolizing the tree in the garden where Adam and Eve made their fatal choice…the three women surrounding his limp body, likely Mary Magdalene gently cradling His feet and the mother Mary holding His head, the angels who long to look into these thing also shown affected by the death and burial of Christ, their God whom they had known since their own creation created in eons past. 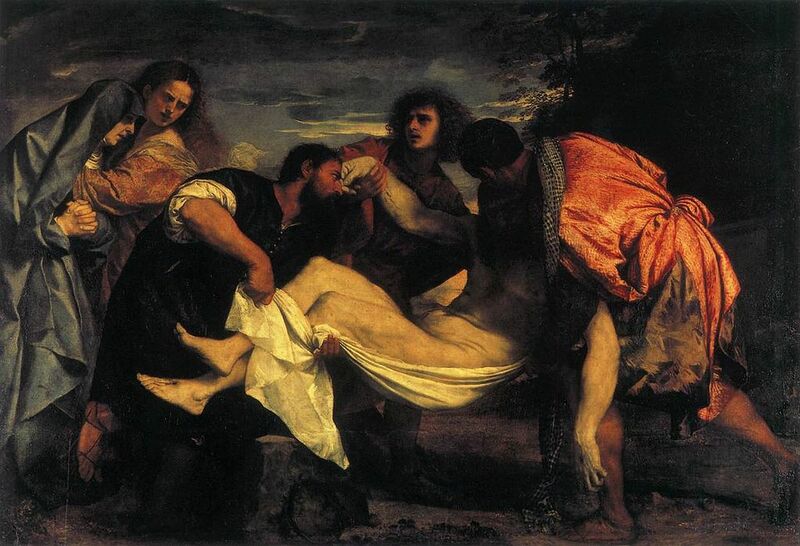 Titian also depicted the entombment of Christ, painting the more intimate scene below in 1520. 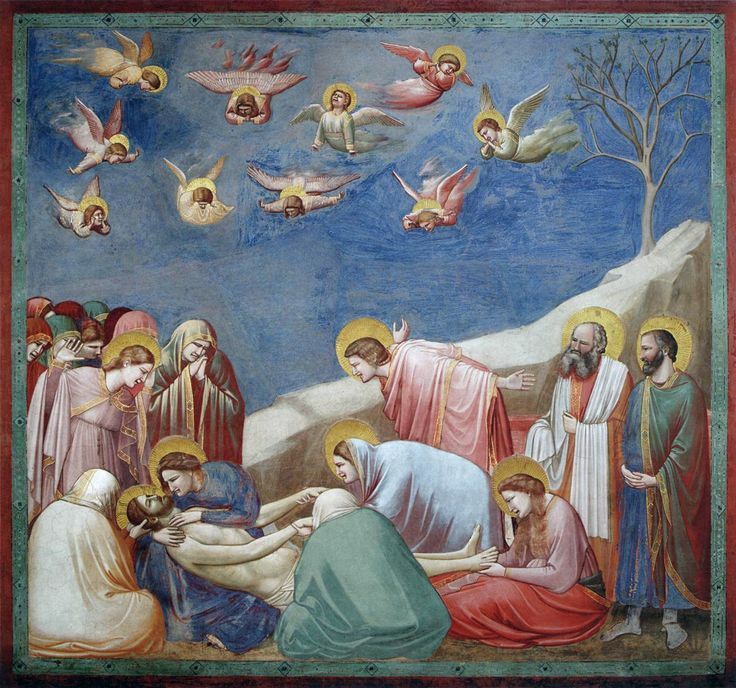 The major figures are at Christ’s death, including Mary, John, Nicodemus, Peter, and Joseph of Arimathea, displaying more restraint that Giotto’s depiction, still carefully remove the body and prepare Him for entombement. The twilight timing allowed Titian’s usual use of darkened tones to add depth to the lamentation. Christ’s upper body itself is receding into the darkness, foreshadowing the tomb. What strength they had to carry Him without staggering under unimaginable grief, and place Him behind the rock! 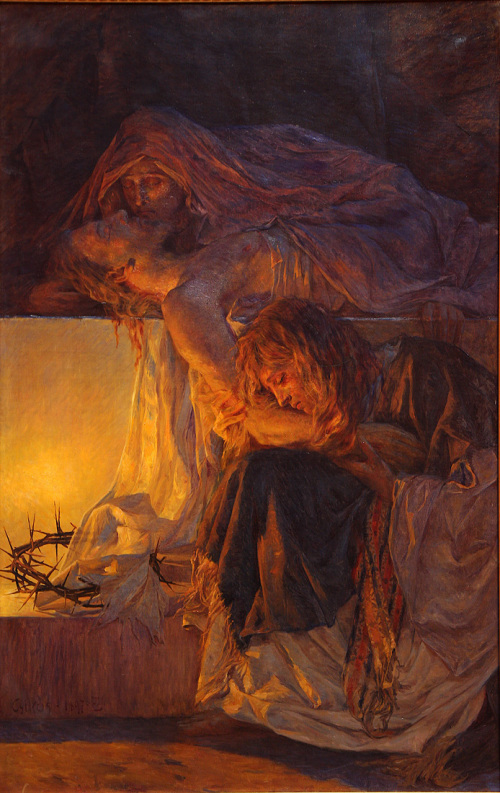 Bela Čikoš Sesija’s Mourning of Christ is an even more intimate portrait. Painted sometime in the late 1800s, this Croatian painter shows the undeniably lifeless Christ in shadow, but His white robe, symbolizing purity and sinlessness is highlighted by a heavenly glow, along with the crown of thorns, symbolizing His suffering. The grief of the two women is also palpable, as is their resignation to the finality of death. Praise God, Sunday is coming! What joy they will know in one more day’s time! For all eternity, death is conquered, swallowed by His suffering and propitiation for sin, absorbing the wrath for His chosen sinners once for all. Hallelujah! Having studied Italian Renaissance art in college, I especially loved this piece. Thank you. Yay, thanks! So I didn’t mangle it!